Pot roast is a comfort food that everyone can relate to. But it takes planning and a long time to cook in the oven. Like, hours! 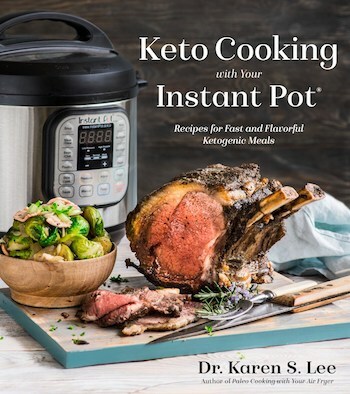 But not in the Instant Pot®! And you know what’s even better? Add the veggies at the end to the almost cooked meat and now, you have a side dish that you don’t even have to use another pan to cook! And who would mind not having to wash another dirty pot or pan? Not me. 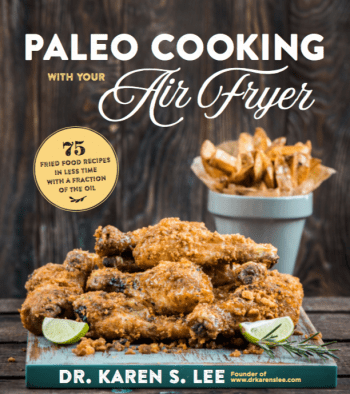 This is one of the reasons why I love cooking in the Instant Pot. 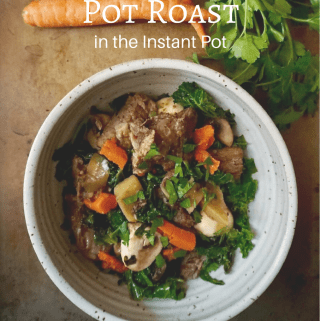 No extra pots or pans to wash. Read more on why you should consider Instant Pot here if you don’t have one yet and see all my Instant Pot recipes here if you already have one. One of the best cuts of meat – and inexpensive – for a pot roast is a chuck roast with marbleized connective tissues and a little bit of fat that are weaved into the muscles. Chuck is from the front – shoulder – of the animal so the muscles are a bit tough. But because of the connective tissues that hold the muscles together that ‘melt’ down, creating gelatin, it tenderizes the meat when cooked. Look for “chuck roast,” “boneless chuck,” or “shoulder steak.” The cut I used for this recipe was a thick chuck steak and not a rump. I had to cut into large pieces so they would snuggly fit inside the inner pot. Don’t be surprised if you end up with meat chunks that fall apart and melt in your mouth. As you can see in the picture, chunks of meat are mixed in with the veggies and not sliced. If you want meat slices, you can use rump or eye round but I warn you; it will not be juicy and tender. Brown or not to brown? I thought searing or browning the meat before cooking preserved the moisture so I used to sear all meats before cooking. But not anymore. According to The Food Lab, searing meats before cooking actually loses more moisture than after! Mind blown. And since you can’t sear pot roast afterward, you don’t need to brown the meat before putting it in the Instant Pot for this recipe. That’s even easier! So stop browning meats from now on. Sear/brown it afterward, which is actually called “reverse sear’, for steaks and prime ribs. To paleo-fy and to make it low-carb, I used daikon (Japanese radish that are long and white) instead of potatoes but you could use any root vegetables like, turnip, jicama, Japanese white yam, rutabaga, radish, and even yucca and they will be as tasty as white potatoes, if not more. It’s also less heavy. Radishes will be lower in carbs so check your carb calculator to see which root veggie you should use. 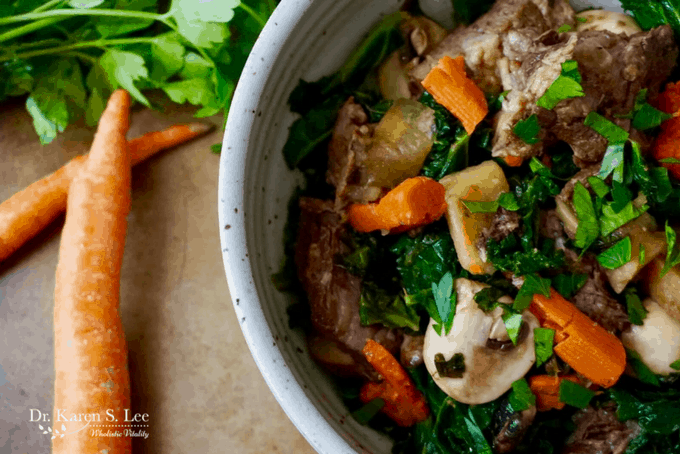 Normally, all meats should be cooked with “natural pressure release” or NPR method with Instant Pot for more tender result but for this recipe, you could use quick release (QR) after 60 minutes since you’ll be adding veggies at the end to be served as a side. You can also add sauteed kale or spinach at the end if you like more greens, as pictured. Pot roast is my family's favorite beef and vegetable dish. And it's one of my favorite dishes to cook since it takes a fraction of a time and all in one pot at once. The prep time of 40 minutes includes 30 minutes of meat coming to room temperature. Cook time of 1 Hr 5 min is the actual pressure cooking time. And adding 10 minutes before you can release the pressure at the end gives you a total of 2 Hrs 5 Minutes from start to finish. 3-4 lb Chuck Roast a shoulder cut. 3/4 cup Beef stock - not broth. Pat the meat dry, rub salt and pepper on the outside and leave it on the counter for about 30 minutes to bring to room temperature. Meanwhile, prepare the vegetables. Cut and chop all the vegetables and divide them in half to be used separately. Reserve daikon, celery, and carrots to be added after the meat is cooked. When the meat is ready, plug in the Instant Pot®. Add half of the vegetables listed in the main section in the bottom of the liner pot evenly. Place the chuck roast on top of the vegetables and herbs. Cut the roast if necessary to fit them in the pot. Add Worcestershire sauce, and beef stock on top to coat the meat. And add the rest of the remaining vegetables, except for the vegetables listed under "To Add After Meat is Cooked." Close the lid tightly, and close the vent. Press “MEAT” and then “—“ to increase the time to 70 minutes. When the timer goes off, release the pressure manually (QR) by opening the vent valve carefully. Normally for meats, you want to release the pressure naturally (NPR) but since you are going to cook again, it's ok to release the pressure quickly for this recipe. When the pressure is completely released, open the lid and add the remaining vegetables listed under "To be Added After Meat is Cooked" on top. Close and lock the lid, press “MANUAL” or "Pressure Cooker" and set the timer for 5 minutes. When the timer goes off, release pressure manually (QR) at 10 minutes. Place the meat on a platter and let it rest for 10 minutes before serving. Take out the vegetables carefully and serve with the meat as a side. This is a two-part instruction so you can serve veggies as a side. If you are buying the meat from a butcher, don’t let him trim the fat. You want the fat to make the meat tender so don’t trim it before cooking. You can always skim the fat after the meat has been cooked.